1. Please use the OFFICIAL software: EleksCAM. And DO NOT use Benbox to control EleksMaker A3, which may possibly cause the hardware damage in controller board. Thanks for your understanding. 2. 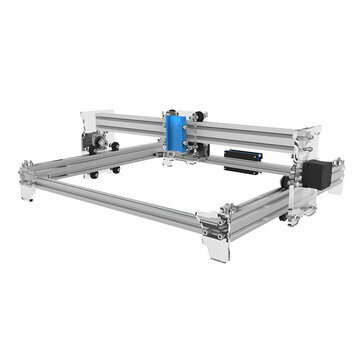 This item is a engraving machine frame construction kit, which comes without laser module. The advantage is that you can add a compatible laser module with various power according to your needs. We recommend the laser module with XH2.54-3P interface that can perfectly fit and be ready for use. 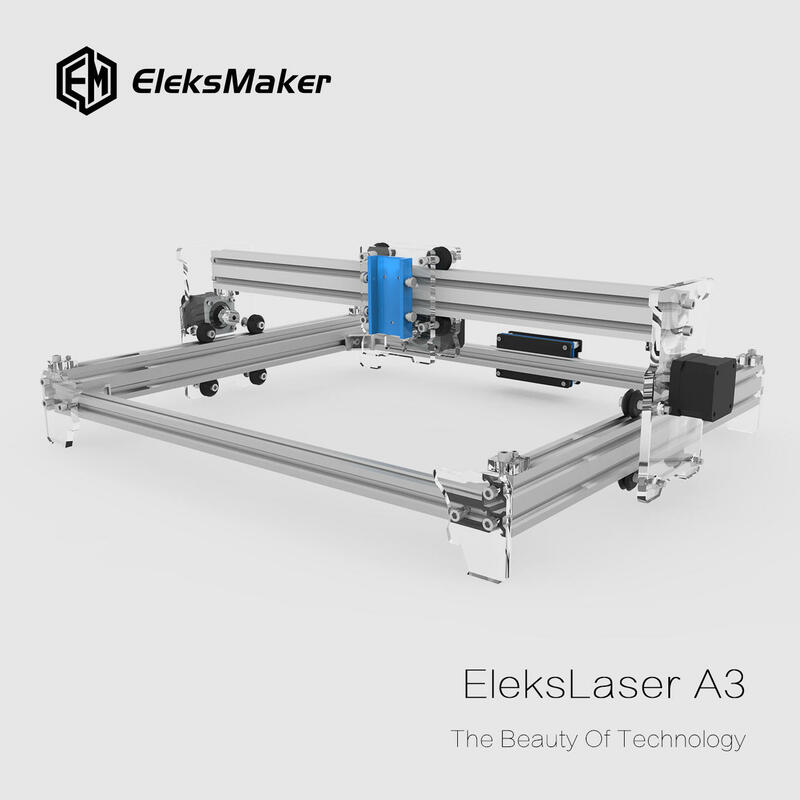 Function Ideal for amateur laser engraving usage, equipped with low light positioning and freedom positioning functions. Features 30X38cm ultra large engraving area,gantry shape design, no engraving height limitation. Three stepper motor drive providing faster moving speed. 2500mW violet laser module with heatsink, high laser engraving power and long term available. 2. This is a whole assemble set and needs to assemble by your own. 3. If you have any quality problem about the machine, please feel free to contact us. Many operative problem can be solved according to your video. It can effectively save your time and energy if you send the video to us with the problem description. Thank you in advance. 1. How to assemble the kit? 2. What software can support this machine? And what image format? Engrave Mode? Supported Software: EleksCam,T2-Laser, GrblController, LiteFire, Laser GRBL, etc. 3. What system can the EleksCAM support? PC Windows XP/7/8/10 , Laptop is ok,too. 4. My laser doesn't work, what should I do? ① The wire connection is wrong.Please check the connection like the picture shown. ② Your computer could not support the software.Please use Win XP 7/8/10 to check it. ③ Software problem .Please check whether wires are inserted rightly. And then check your data setting. ④ The kit misses some accessories. Please compare with the instruction and tell us, we will solve it once you send us the email. ⑤ Laser module/ driver board/power supply is broken. Please check which part is the main problem, and then send us a video to prove it. Or you can send us a video about your software setting, working laser and driver board. We will analyze it and give you a solution. 5: My software shows: Not data, what should I do? ① You did not open Administrator privileges to run the software. Please try this. ② Your computer architecture is incomplete:check whether VC ++ and. Net and directX are installed, and have to turn off the virus. 6. Can I regulate the laser power or the laser power is adjustable? Our new Mana SE controller board can adjust the power. Please download our ElekesCAM software to do it. 7. Can I upgrade stronger power laser module by myself? Can I extent rail frame? Yes, you can. DC12V laser module can be installled on this machine. The red is positive. You can also extent the frame by yourself, but we do not provide rails. Please note that. it does not move. What should I do? The EleksCAM could move by hand but could not move when focus.The probelm is the area and language inside the system control panel.Please set the format to English and United States.Then it will be ok. Detail is shown in the wiki link above. 9. If my laser is broken and I might find the reason(Or I could not find) . What should I do? ① Find the reason: Take a video to prove the part is broken and then send it to us. we will give you a solution according to your video. ② Could not find the reason : Check the Question 4 first. If the problem could not be solved, please feel free to contact our customer service with a video: cservice@banggood.com. The video should contain software setting, broken part details and the power-on machine. We will solve it asap.